“There was once a princess, the fairest one in all the land.” This is how the new book The Princess and the Three Knights, written by Karen Kingsbury starts off. In this fairytale, the King is looking for a knight worthy enough to marry his beautiful daughter. The knights of the kingdom endure various tests to prove their love for the King’s daughter. In the final test, the real meaning of true love shines through. Karen Kingsbury is a New York Times best-selling author and has written more than 40 fiction titles. She is also dubbed by Time magazine as the Queen of Christian Fiction and one of her novels is being made into a major motion picture and is due to be released in early 2010. Having a princess Baby Bird of my own, I enjoy this book. It teaches that not everyone always has your best interest at heart and how important it is to find someone who wants to give you a great happily ever after. It also shows the importance of looking for inner beauty, kindness of heart and strength of character. The drawings in this book are fit for a princess and the cover has the nice added touch of some glitter. The book is illustrated by Montreal-born Gabrielle Grimard. She began her career as a muralist, painting numerous walls in commercial buildings in the Montreal area. You can buy this book online at Zondervan or on Amazon.ca. Thanks for sharing, this looks like something my little girls would love to read! This sounds like a wonderful book to read at bedtime to my princess. My granddaughter is a big fan of princesses so she'd love to have this book. Karen Kingsbury writes some great books. I'd love to give this to my nieces. i'd love to read this book to my niece. I would love to read this to my students! I would love to have this book for my niece. She loves books. I like her adult book and love fairy tales, so count me in! I know a little princess would love to have a copy of this book and Karen Kingsbury is a wonderful Christian author. I would love to win this book for my daughter, Areeha. She loves reading. I take care of many little princesses-this book would be awesome! I would love this book for my niece! My neice would love this book. Looks like a great book, think my daughter would love it!! thanks for another awesome review and giveaway! 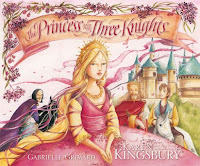 I love children's books and have a little princess who is sure to love it. This sounds like a beautiful book, to both read and look at! My little girls are very in to princesses right now. I'm sure they would love this book! Who doesn't love a princess book?! Hope I win so I can read it to my little girl. My mum truly believed to read to a child was the ultimate connection. My mum died recently and was never able to read to her 2 year old great grand-daughter. I would love to be able to read it to her (my great neice), on behalf of my mum. Thanks for giving me this possible chance. I have a princess who could use a copy of the princess book.Great job.